We spent far too long trying to decide where we’d take the girls for Phoebe’s birthday this year. We always do a family day out instead of parties and stuff. She’d asked if we could go to Drayton Manor, which isn’t very far from home. However, I think the prices are ridiculous for a day which essentially spent in a queue. Then we thought about Legoland and discounted it for the same reason (getting people to pay a minimum of £25pp to queue jump is not ethical Legoland #justsaying). Instead, we decided to go to The Eden Project for a couple of days. We took Eleanor for her second birthday and it was hands down the best day out we’ve had. When we do a day out, we don’t tell the girls where we’re taking them. Trying to keep things a surprise now that Eleanor is good at reading is nigh on impossible. Didn’t help that Siri shouted something about “route to the Eden Project” as I got in the car setting the sat nav. Bloody technology. If you saw my post about Phoebe’s birthday on Instagram you’ll know that a massive highlight of the day for her was going to Gloucester Services. She’s a funny little thing. To be fair though, it is actually a pretty nice place to sit and relax for a bit. There’s a lovely wooden play area for the kids and they even have vegan cakes. Winning. 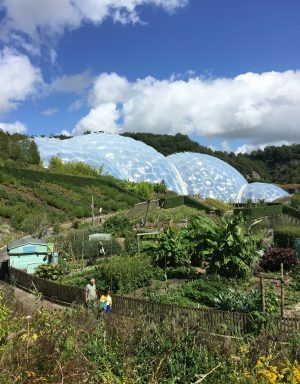 As getting to Cornwall from Birmingham is a fair jaunt, we’d decided to stay overnight and have two days at The Eden Project. 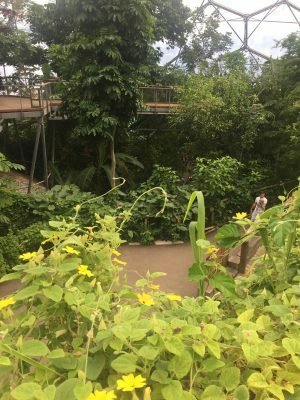 Something I really like about The Eden Project is that the advance pass tickets are valid for a whole year and you can go as many times as you like, which is far better value for money than a theme park. Plus, I hate theme parks anyway. We bought a family ticket for £64, which was more than worth it just for the two days we were there but we’ll definitely go back again in 2019. The girls were massively excited when we got there, even though they didn’t really know what to expect. Eleanor only has a vague memory of going on the 2nd birthday. When you arrive, it doesn’t really look like much at all, you can’t see any of it because it was actually built in a clay pit. There is absolutely loads of free parking and if you need to you can jump on the shuttle bus to take you to the entrance. Even as you go through the entrance, you still can’t see the site. It’s very well hidden and the biomes are a lovely surprise when you get through the ticket office. 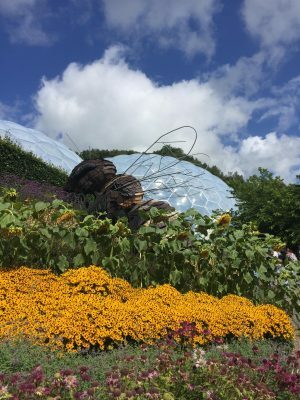 Part of the reason for choosing The Eden Project as a trip away was that the girls are very interested in the natural world around them. I wanted to take them somewhere that was fun, interactive and educational. 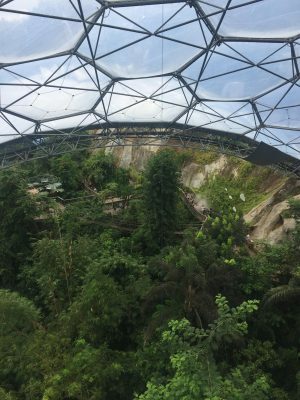 The Eden Project isn’t just somewhere to go to marvel at what the natural world has to offer. They put on so many events throughout the year that I’m a bit sad we don’t live closer! When we visited in August there was a space theme and so there were little shows and activities for the kids to join in with. I really love that they do this because next time we visit it’ll be a completely different experience as they’ll have a different theme running. Makes that annual ticket definitely worth it. In all honesty, I found a couple of the shows a little cringey to sit through, and the girls were utterly baffled by some nonsense with an alien vlogger giving awards to planets. I don’t know why drama students seem to think themselves hilarious… kids don’t get your jokes, guys. The highlight of all the spacey stuff we did was when the girls got to have a go at tubing down a hill. I’m not sure what the link was to space, but they loved it anyway. The Biomes really are a sight to behold. 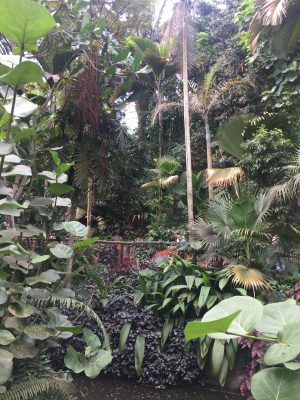 My favourite is the Rainforest Biome, although I do remember not being so keen on the temperature when I was 7 months pregnant with Phoebe! Nestled amongst the very natural and wild landscape, they look almost alien and out of place, but inside they are amazing. The Mediterranean Biome is very bright, warm and has some amazing plants and trees inside, along with all kinds of tomatoes, chillies and other food being grown. We were amazed at how big the aubergines and tomatoes were! There’s also a restaurant inside which looked like a lovely place to sit (the girls had other ideas). 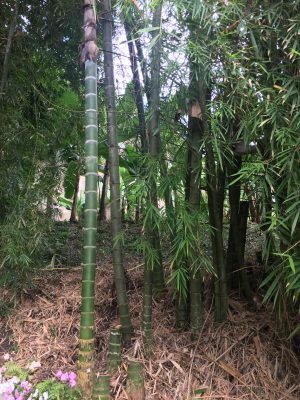 We didn’t spend a lot of time walking around the Mediterranean Biome, as Phoebe was having a bit of a strop about how busy it was and that she desperately needed a snack. 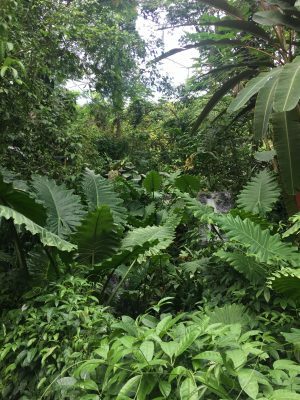 The Rainforest Biome definitely captured the attention of all of us a little more. The heat kind of hits you as you enter and the lush deep green landscape is just amazing. Being a bit obsessed with succulents and plants at the moment, Eleanor and I were very interested in the different kinds of plants we could see. Phoebe was busy looking for the lizards and birds promised on a sign as we entered. One of the highlights for the girls was a bridge right at the top of the Biome. It shot steam out every few minutes. It was like walking through clouds and a welcome relief from the heat. 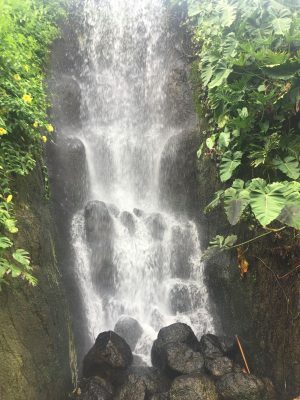 I loved the waterfall for the same reason. Incidentally, there is actually a cool room you can escape into if you’re feeling the effects of being too hot. There are also water fountains dotted about the place too so don’t forget to bring a water bottle! Another thing we all enjoyed was doing a tree top walk. It was worth waiting in the queue to go on a walkway that went right above all of the trees. The view was amazing and I definitely need a decent camera to start capturing things like that. My Mom absolutely hates bridges so, being a delightful daughter, I made sure I sent her a few pictures, haha. For us, a key part of any family day out is what we’re going to eat. The girls love a snack (or several) and are constantly asking when it’s time for lunch or dinner. 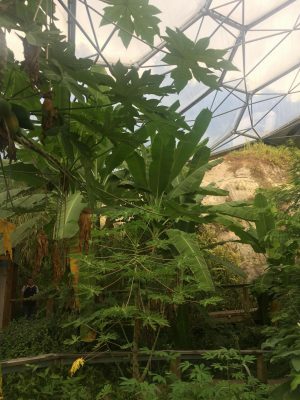 We were fairly confident that The Eden Project would cater for our vegan diet and we weren’t disappointed. It was probably the biggest choice we’ve had at a place that isn’t exclusively vegan. Whatever your dietary requirement, you’ll find something to eat! There is a lot of choice. What is a family day out without a trip to the gift shop, eh? Especially when you have to leave through the gift shop! There is a smaller gift shop in between the two Biomes as well. Plenty of chance for the girls to spend birthday money (and some of ours too!). At least everything in there has some ethical and eco-friendly credentials. The girls bought themselves a t-shirt each amongst other things and I, of course, bought some plants.